Samuel Rodriques '13 has been awarded a Goldwater Scholarship. The scholarship program, which honors Senator Barry M. Goldwater, was designed to aid outstanding students in pursuing careers in the fields of mathematics, the natural sciences, and engineering. Rodriques was one of 282 Goldwater Scholars selected on the basis of academic merit from a field of 1,123 students who were nominated by the faculties of colleges and universities nationwide. 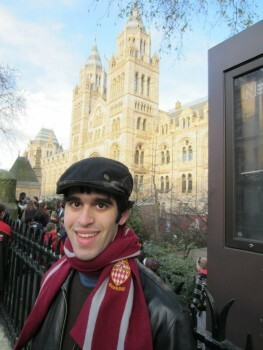 “I owe a tremendous amount of gratitude to professors Stephon Alexander and Peter Love who have mentored me throughout my time at Haverford, and to the Physics Department, which provides a fantastic support network and numerous opportunities for its students,” says Rodriques, who has spent the academic year abroad at Fitzwilliam College, Cambridge University, taking graduate and undergraduate courses in applied mathematics and theoretical physics. “The research focuses on investigating whether quantum entanglement can play a significant role in biological process like photosynthesis,” he says. Rodriques was also the recipient of the Beckman Scholarship this year, which funds 15 months of research for exceptional science students. He will be using that grant to return to Harvard University, where he spent the summer of 2011, for a second summer devoted to continued research on quantum information.